When Howard Grossman of Southborough was asked what people might not know about him, he pointed out that he doesn't have an advanced degree, saying real-life experience can be like a Ph.D. If he had one, Grossman's Ph.D. would be in real estate and retail. For Grossman, the real estate industry's lure has not waned in more than 35 years. Whether it's been in retail leasing, real estate development or investment sales, "it's always been real estate in some capacity," he said. Grossman was New England director of real estate for CVS Pharmacy beginning in 1979 and went on to manage the Northeast mall leasing program for its parent company. He headed up the Howard Grossman Co. in the 1980s and early 1990s, a property management and development firm. After that, it was on to Marshalls, where he was senior vice president for real estate, construction and store planning. In his role as senior vice president for the Northeast for Katz and Associates during the latter part of the 1990s, Grossman represented retailers looking to expand into the Northeast. Then it was on to Samuels & Associates from 2000 to 2008. Grossman, the developer of Lakeway Commons in Shrewsbury, on the former Spag's site on Rte. 9, recently announced Starbucks and Burton's Grill to that mixed-use development lineup, with Whole Foods as its anchor store. This summer, Grossman says, the structures on the 20-acre site will be razed to make way for up to 100,000 square feet of retail space and housing. "I love the concept of mixed use; I have for a long time," said Grossman. However, he said, he still finds work in traditional retail development rewarding, as well. Grossman has another mixed-use project under construction now in Latham, N.Y., with 500,000 square feet of retail and restaurant space. "You get attached to your projects, because of what people don't see: the long hours, days and weeks that go into it," Grossman said. "It's rewarding to see it come to fruition." 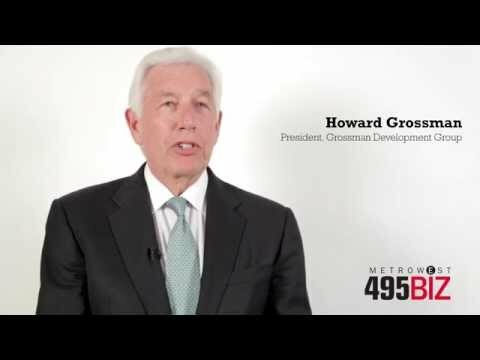 As for the real estate industry overall, Grossman likes that it's always changing. "It's different every day … I've enjoyed the challenges, it's a rewarding career when you see product you take from nothing to completion."